The 1912 Presidential election saw the first, (and last), time in our nations history that a third-candidate received both more popular and, more importantly, more electoral votes than one of the two established parties. It would be the highest popular vote total that a third-party candidate received until Texan billionaire's Ross Perot's impressive 19% showing in the 1992 Presidential Race. The division in the Republican Party was caused by ex-President Theodore Roosevelt's failure to secure the nomination and his decision to run as the standard-bearer for the newly-formed Progressive, or Bull-Moose, Party. The refusal of progressive Republican Senator Robert La Follette of Wisconsin to endorse Roosevelt's candidacy was unfortunate for the Roosevelt campaign as La Follette was regarded as the greatest reformer in the country at the time, save for President Roosevelt. The Democrats that year held their convention in Baltimore and nominated Governor Woodrow Wilson of New Jersey after Democratic standard-bearer in the 1896, 1900 and 1908 elections, William Jennings Bryan, endorsed Wilson which then denied the powerful Speaker of the House Champ Clark ,of Missouri, the nomination on the 46th ballot. Wilson chose as his running mate Governor Thomas Marshall of Indiana, who famously remarked later that "What this country needs is a really good five-cent cigar." The Republican Convention that year was held in Chicago and was marred by the failure of both Roosevelt and La Follette to wrest the nomination of the Party from incumbent President Bob Taft. Roosevelt's supporters then walked out of the Convention. Taft's Vice-President, James Sherman, was re-nominated without trouble. The Roosevelt supporters who walked out of the Republican convention and reconvened for their own convention in Chicago in early August where Roosevelt was nominated for President on the first ballot. Governor Hiram Johnson of California had helped found the Progressive Party earlier that year and was close politically to Roosevelt, so he was a natural for the Vice-Presidential spot on the ticket. When asked about how he felt, Roosevelt answered that he felt as strong as a Bull Moose, and from then on the Party became known as the Bull Moose Party as well as the Progressive Party. As we all know, Woodrow Wilson, using the dissent in the Republican Party, to scratch out a popular vote plurality but utterly dominated the electoral landscape, winning 40 out of 48 states, 435 out of 531 electoral votes. 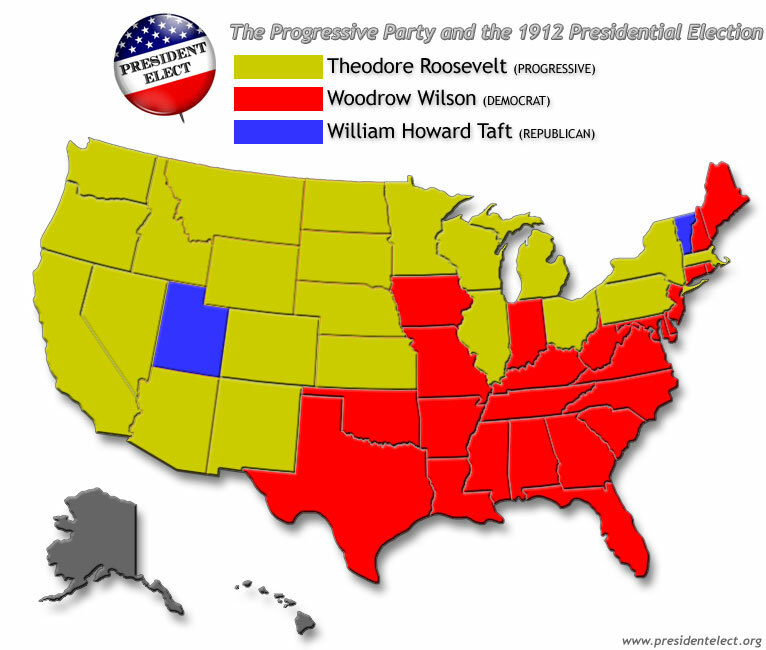 President Roosevelt's Progressive Party carried 6 states for a total of 88 electoral votes while the Republicans under Taft trailed far behind winning only two states, Vermont and Utah, with only 8 electoral votes. The Progressive Party collapsed soon after the 1916 elections when Theodore Roosevelt endorsed the Republican candidate for President, Supreme Court Justice Charles Evan Hughes. But, what if it hadn't? What if Roosevelt had been elected in 1912? What would the country be like today? What would the political landscape look like? To answer the question of what would happen if Roosevelt's Progressive Party had won the 1912 election one must first figure a way to ensure he wins the election in the first place. The obvious place to start is the refusal of Senator Robert La Follette to support Roosevelt in the general election. If some accommodation can be made with him, the spot on the Vice-Presidential ticket perhaps instead of Johnson, then the Progressive's chances of victory go much higher. A look is also necessary at what states Roosevelt needed to win the election. New York, Illinois, Ohio, Wisconsin, Massachusetts, together with 129 electoral votes were must-haves for the Roosevelt campaign. Also, the Western states that went Democratic because of the split in the Republican Party but were extremely progressive, had among them 54 electoral votes and if he carried these states in addition to the ones aforementioned then Roosevelt could have won the election with 273 electoral votes. If Roosevelt would have gotten the states in yellow, he would have won. If Theodore Roosevelt had succeeded in winning the Presidency in 1912, it is likely that very quickly the Republicans in Congress would either switch to his Party or dwindle into a conservative regional party strong only in New England. In the 1912 Congressional elections of our history, even with Roosevelt losing the Progressives had one Senator and 9 Congressman and it is likely that they would have multiplied to a number approaching perhaps 10 or so elected Progressive Senators or progressive Republicans switching the Party and around 40 Congressmen. The 1916 election will be the one that will determine if the Progressives live or die as a political entity. If they keep the White House and maintain or expand their Congressional numbers likely they shall be an entrenched political party. If they lose narrowly with the Republicans again a nonentity then they, not the Republicans, would emerge as the main opposition to the Democratic Party. If they lose in a landslide with the Republicans picking up many seats, than it is likely that the Republicans and the Progressives would fight amongst themselves with the Progressives emerging as the likely victor due to the Republicans being seen as the more conservative party of the two and with the defeat of liberal Democratic reformer Woodrow Wilson the Democrats probably would have changed their positions to please the base of their party, the Southern Democrats. Civil Rights for the African-American citizens of this country most likely would have been achieved earlier. They took so long to get passed because the Democratic Party of our history was notorious for being schizophrenic, a reactionary southern faction and a liberal northern faction, and the southern faction controlled the Senate so they could filibuster any civil rights legislation with the help of conservative Republicans, and the Progressives do not have this problem. Even so, it is unlikely that popular support for Civil Rights could have defeated the Southern filibuster before the 1940's, which is still a good 20 years ahead of our history's 1964. Today, the nation would probably have two main political parties and maybe, if the Republicans were lucky enough, a regional one centered in New England. They would be the Progressives, with their strongholds on the West Coast, the Great Lakes region and the Midwest. They most likely would advocate a liberal fiscal policy, national health care, progressive income tax and so on and so forth. Their social policy would be a bit different as many prominent Progressives were proponents of eugenics and it was not considered the barbaric and inhumane practice that it is considered today until the Nazi's discredited it in the 1930's and 1940's. The Democratic Party would likely have a stranglehold on the South, the Mid-Atlantic and Northeast. They would be considered the more conservative of the two parties, advocating balanced budgets, tax reductions, privatized health care and so on and so forth. Their social policy would be much like the one of the Republican Party today, against abortion, gay marriage, stem cell research etc. In our history, demographic changes in American society, mainly occurring in the South and the West, are benefiting the Republican Party but in this history, with the Progressives likely being the dominant power in the West as opposed to our Republicans, such demographic changes, if they still occur, which is debatable that they would, would benefit neither party. "1912." 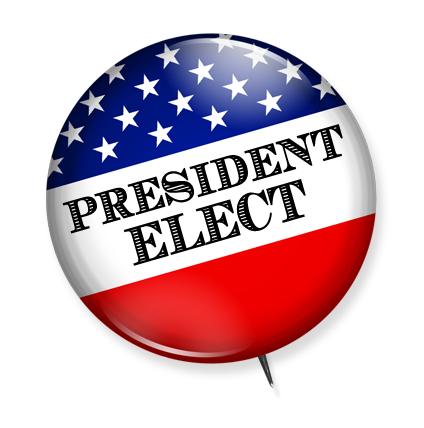 President Elect. Ed. James R Whitson. 16 Jan. 2009 http://www.presidentelect.us/1912. 1912 Presidential Election . Map. Nation Master. 17 Jan. 2009 http://www.nationmaster.com/encyclopedia/Image:ElectoralCollege1912.png. "Presidential Election 1912 States Carried." History Central. 16 Jan. 2009 http://www.historycentral.com/elections/1912State.html. "US President - R Convention." Our Campaigns. 16 Jan. 2009 http://www.ourcampaigns.com/RaceDetail.html?RaceID=57974.